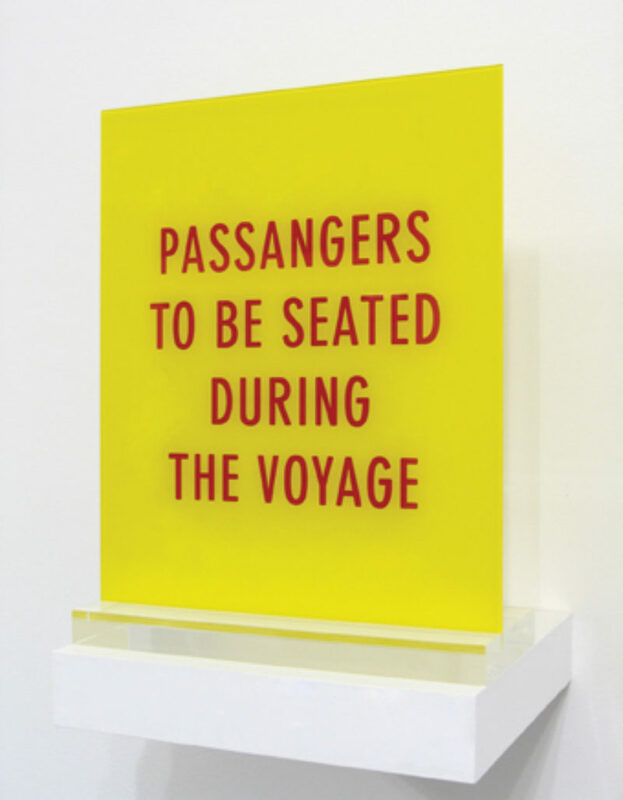 ‘Passangers to be seated during the voyage.’ We’ve all read a statement like this before, perhaps on a tour bus or a fairground ride. These particular paroles trouvé exist both on a boat somewhere in Cambodia, and as the subject of a plexiglass engraving by Alice Guareschi. Significantly, they also formed the title of the artist’s first major solo show at Sonia Rosso gallery, 2007. Spelling aside, they’re a chance find with a further serendipitous glitch. The word ‘voyage’, perhaps better written in its context as ‘journey’, instills the impending passage of time with a metaphorical mood, a condition that has developed into an integral and increasingly surreptitious backdrop to Guareschi’s practice. The words were spotted by Guareschi while travelling along the Sangker river in West Cambodia in 2005, a trip that provided the footage for ‘Racconto d’inverno #3. Della possibilità di sguardo in proporzione alla velocità del movimento ’ [Winter’s tale #3. On the possibility of looking in proportion to the speed of movement]. The film builds an unexceptional narrative and never appears to go beyond a broadly explorative approach to its location. As the title indicates, it’s a modest, unaggressive work that endeavours to capture a foreign context with self-awareness and a neat philosophical realignment of its method. Filmed from a boat and the back of a moped, the landscape rapidly flows across the screen, punctuated by chance, everyday elements. Guareschi sets up the journey and its landscape as axes that visualise prescient, metaphorical terrain: a process through which we encounter subjects and apprehend experiences, a passage of movement through which choices are made and thoughts are formed. In short, it’s the distance we travel that inspires the necessity of communication. It’s an elegant formula that’s almost too slick to have visual leverage, especially in a film like ‘Racconto d’inverno #3’. But one of Guareschi’s talents, evident in much of her sculptural work, is her ability to illustrate erudite perception with stimulating tactility. A work such as ‘Esercizio temporizzato di una pausa bianca ’ [time-set exercise of a white pause], 2005, is characteristic: a printed colour wheel is mounted onto an electric motor that sits on top of an iron tripod. The motor, moderated by a timer that operates the device at random, sporadically, and momentarily, spins the amalgam of colours into a white disk. There are all sorts of allegories in this contraption. Whiteness (classical purity, clarity, a moment of supreme consciousness), is sprung on the viewer from a mass of every given colour at any given time; the tripod is a drum stand, an implicit underlying rhythm, the beat of a regulating duration. It’s a romantic leap, but one that this unassuming gadget endearingly invites, its illustrative role-play being borne out of the scrutiny that drives Guareschi’s work. This scrutiny tests the methods we use to register different moments in time or location. ‘2005’, made in 2005, is a work that recalibrates the year 2005 as a physical distance rather than as an expanse of time. Guareschi painstakingly sliced the days of 2005 from a calendar and reassembled them to form a tape measure. However, her most audacious piece of ordering appears in her film ‘Bianco, Giallo, Rosso, Nero. Un’Avventura Cromatica ’ [White, Yellow, Red, Black. A Chromatic Adventure], 2009. It’s a 90-minute epic in which very little happens, but for Guareschi’s systematic voyage with camera in hand to the White, Yellow, Red and Black Seas. What emerges through Guareschi’s spirited logic, is the infinite choice we have to create order and meaning. ‘Due Dadi ’ [two dice] and ‘The silence sound sense’, both 2007, are among Guareschi’s most abrupt works. The first consists of two cumbersome wooden slabs that rest against the wall each inlaid with 21 black marble dots, an accumulation of the numbers on a dice. It looks like a game, but each move has been rolled out with uncompromising monumentality. ‘The silence sound sense’ is probably Guareschi’s neatest trick. Four leather-backed untitled books form an innocuous pile. Each book is double-bound, rendering their contents inaccessible. On the one hand it’s an aggressive statement, on the other, it seals and preserves an infinite source of potential. The emphatic duplicity of this and ‘Due Dadi ’ creates an empowering self-negation that parallels the mathematical imperative that two negatives equal a positive. Quoted Values and Outer Spaces, Guareschi’s most recent show at Alessandro de March gallery, was a tight constellation of new work moving across a broad visual range, from scrupulous text pieces to abstract ceramic arrangements. Taking on the role of eye witness, ‘Distance language’, 2010, is a lenticular print of a quote from one of Guareschi’s major influences, Gregory Markopoulos: ‘Distance becomes the secret language with which the conversation takes place’. It’s a directive that set her more abstruse works in motion. Its duplicity—produced with a method of printing that switches the position of the words ‘distance’ and ‘language’ depending on the position of the viewer—literally activates the reciprocity of the conundrum. Two separate works with the same name, ‘I giorni e le ore’, 2010, appeared to peg out this ‘distance’ or ‘language’. Seven elliptically-shaped prints of seven different skies were spread over a wall; seven geometric ceramic forms sat close-by, like fragile articulations literally plucked from thin air. 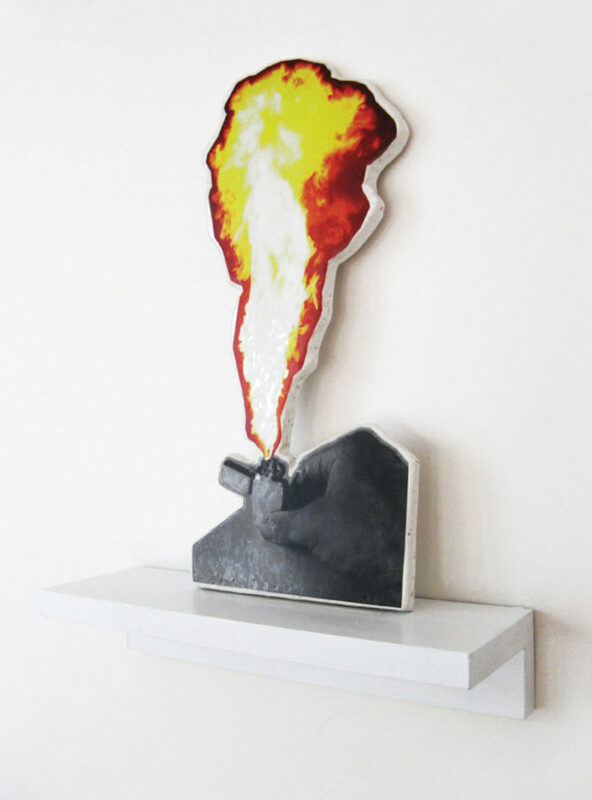 The pairing visualised a matrix of communication and in turn contextualised in the abstract works such as ‘The production of thought while speaking’, 2010, an image of an ignited cigarette lighter taken from Ed Ruscha and printed onto ceramic, its title a Heinrich Von Kleist quote which came to Guareschi via a friend. Guareschi’s world of hyper-relativism never appears so easy as to be indifferent. Instead, this philosophy graduate with the disposition of a toy-maker, lays out propositions or tools for diversion. 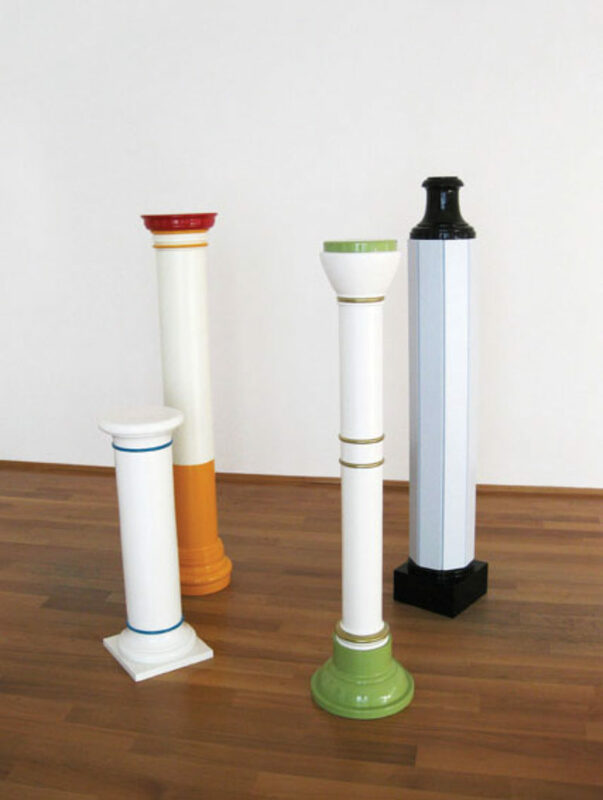 ‘Nella foresta ’ [Into the forest], 2010, a cluster of four freestanding lacquered wooden posts that allude to the form of classical columns, is indicative and plays allegory to the rationality of Quoted Values and Outer Spaces . It’s an invitation to take up the voyage and ride its duration: a fertile, indefinite expanse in which slivers of clarity present themselves. Fiona Bradley, director of the Fruitmarket Gallery, talks about Scotland’s representation at the 54th Venice Biennale.